Tsubaki manufactures various types and sizes of chains, sprockets, and power utility components that are engineered perfectly to support your unique operations; putting your needs first. Along with our other exceptional products, we offer a wide selection of bushings and weld on hubs options to pair with their respective bushings for sprockets and pulleys. QD bushings are easy to install and remove from applications. They offer superior clamp force due to split running through the flange and the barrel. 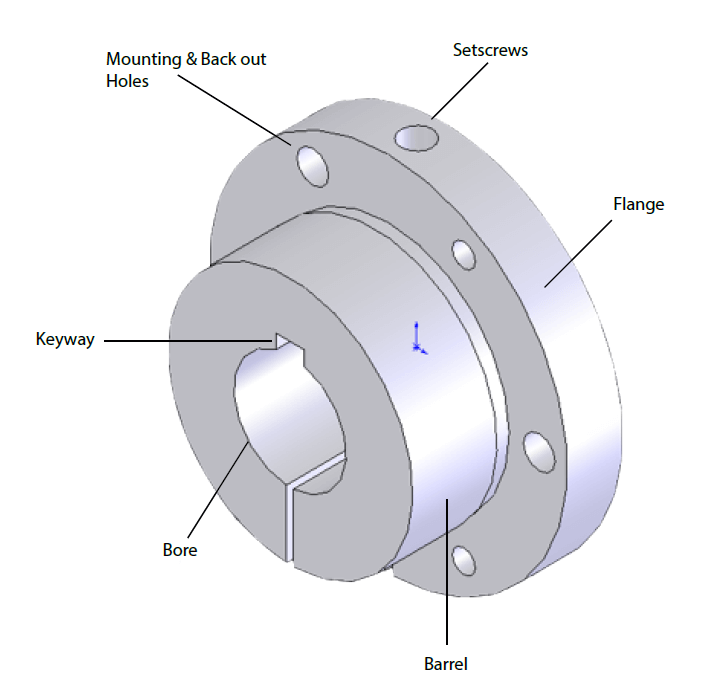 They require large bolts around the circumference of the flange to retain themselves to the sprocket. The barrel is tapered at ¾” per ft and align the sprocket 90 degrees to the drive shaft to ensure proper alignment for smoother running operation. QD bushing sizes from smallest to largest are JA,SH,SDS,SD,SK,SF,E,F,J,M,N,P & W. They can be reversed mounted through size J. Similar to QD, TL comes with a split-through taper and flange to provide a strong clamp force to the shaft. 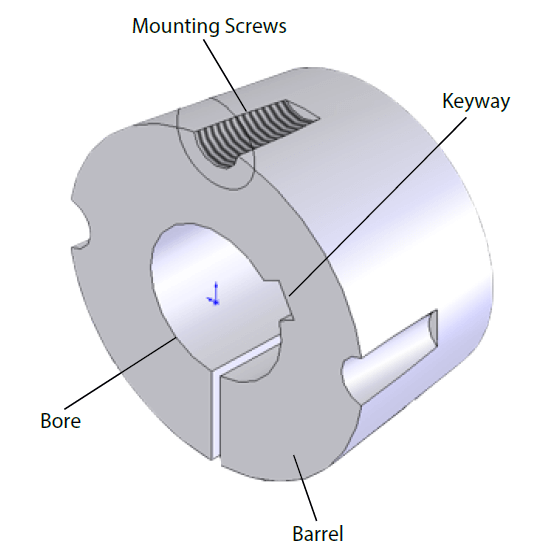 A series of set screws on the outside diameter of the bushing are used to retain the bushing to the sprocket, however, screws are not required over the drive shaft key. The barrel is tapered at 1.686” and cannot be reverse mounted. TL bushing sizes from smallest to largest are 1008, 1108,1210,1215,1310,...8065. For ST, the barrel is tapered 0.75” per foot and comes with a double split on barrel only. 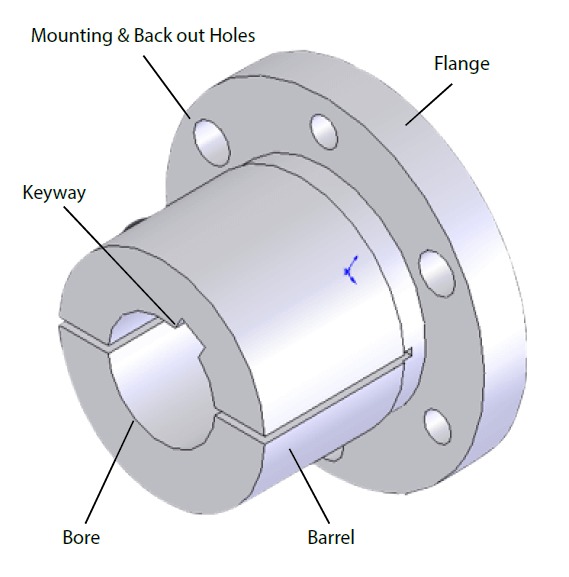 A series of screw holes around the flange allow the bushing to retain itself to the sprocket. ST bushing sizes from smallest to largest are H, P, Q, R, S, U, W. Each size comes with type 1 and type 2 options. For more information on bushings, please contact your local Tsubaki representative at 905-676-0400. 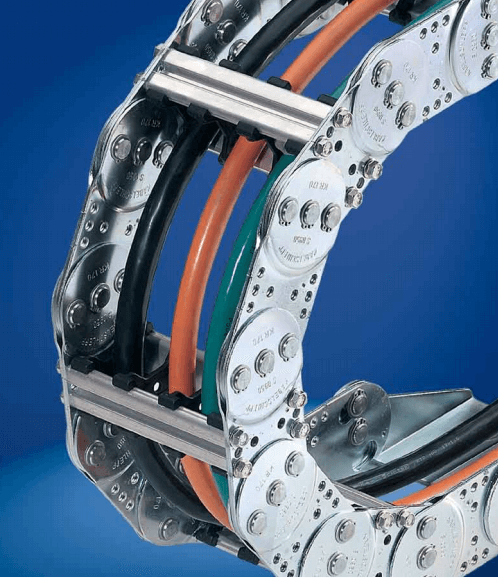 The S/SX Series is an extremely stable and robust series of steel cable carriers, capable of carrying heavy loads and withstanding harsh environments. It demonstrates high stability, due to a unique chain link sandwich design, consisting of two plates welded together. Optimal link design allows contaminants found in harsh environments to fall through without building up for a continuously running operation. This design allows for extended unsupported lengths and high additional loads without sagging when perfectly sized to the application. A stroke system with special bolts and locking rings extends service life. Dividers made from plastic or steel along with other dividing options maintains neat cable separation. Covers with the aluminium cover system or steel strip are available for further aid in cable protection. Choose from galvanized finish or stainless steel construction and a wide variety of dimensions to find the right fit for your operations. For more information on S/SX Series, please contact your KabelSchlepp factory representative at 1-800-443-4216.